Amazon.com description: Product Description: Communication is essential in a healthy organization. But all too often when we interact with peopleâespecially those who report to usâwe simply tell them what we think they need to know. This shuts them down. To generate bold new ideas, to avoid disastrous mistakes, to develop agility and flexibility, we need to practice Humble Inquiry. 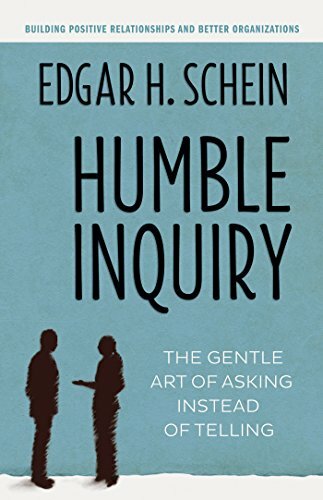 Ed Schein defines Humble Inquiry as âthe fine art of drawing someone out, of asking questions to which you do not know the answer, of building a relationship based on curiosity and interest in the other person.â In this seminal work, Schein contrasts Humble Inquiry with other kinds of inquiry, shows the benefits Humble Inquiry provides in many different settings, and offers advice on overcoming the cultural, organizational, and psychological barriers that keep us from practicing it. About: Communication is essential in a healthy organization. About: [Read by Lloyd James] The key to effective communication Communication is essential in a healthy organization.